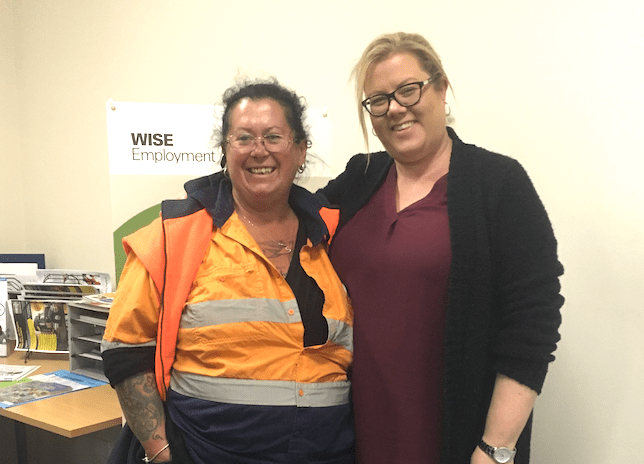 Sheryl approached WISE Employment Pakenham jobactive in January 2012 after struggling to secure a job she truly enjoyed. Trustworthy and reliable, she has worked hard to pave a successful career for herself. Throughout her employment journey, Sheryl has had diverse work experience across a number of roles in retail, admin, customer service and warehouse. Today, Sheryl is working in the traffic control sector. In May 2017, Sheryl attended the Job Fair at WISE Employment Dandenong where she had the opportunity to meet with Monjon for one of their traffic control positions. To be suited for the role, WISE organised for Sheryl to complete all of her ticketing and licensing training certificates. After her training, Sheryl was thrilled to secure the role. “WISE Employment has been so fantastic, I don’t know why I didn’t go to them ten years before I did! I loved working at Monjon, the staff are fantastic and I can’t thank the WISE team enough,” said Sheryl. However, it hasn’t all been smooth sailing for Sheryl. Over the years Sheryl has faced a number of rejections and one her hardest hurdles was being unemployed for six years. But despite this, Sheryl continued to show up for appointments, complete training courses and do whatever was needed to secure a job. Not long after starting at Monjon, due to an unforeseen medical condition, Sheryl regrettably had to cease working. After taking some time off to focus on her health, Sheryl recently returned to the workforce and went back into employment as a traffic controller with Advanced Traffic Management in December 2017. Sheryl describes this to be a great experience with great people.